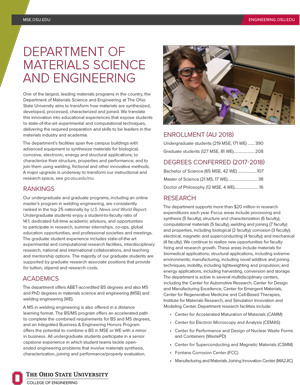 For those prospective students seeking a Master's and/or PhD in the fields of Materials Science and Engineering or Welding Engineering. Applicants must hold a Bachelor's degree or its equivalent prior to the proposed semester of admission. Includes details on application requirements & procedures, financial aid, degree requirements, and more. The Welding Engineering graduate program is proud to offer a 100% online Master of Science in Welding Engineering for students with a Bachelor of Science in Engineering or allied field who are seeking to expand their knowledge. Our online distance education program allows students from around the world to access our courses with no on-campus residency requirement. Additionally, these courses are billed at in-state rates regardless of the student's citizenship or location. Includes instructions on how to prepare for arrival on campus, housing information, details on student health insurance, and other useful pre-arrival matters. For currently enrolled graduate students in the MSE and WE programs at Ohio State. Includes information on the three degree tracks within each program (MSE and WE), financial aid, courses, seminar schedule, graduation procedures, employment, BS/MS program, and more.